The 4th of July is here! Best. Holiday. Ever. You spend all day eating and picnicking and soaking up the sunshine, only to top it off with fireworks and more junk food late into the night. Being obsessed with food like I am, the 4th and Thanksgiving pretty much make my year. Come Tues, it's on to turkey baby. In the meantime, I can't wait to celebrate America and get out my red, white and blue. 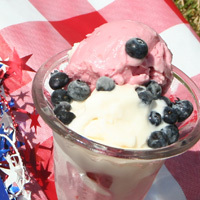 This party gets started with some festive All-American frozen yogurt in our nation's colors. Can you say, "Less work than a flag cake?" My Dad was born on the 4th, so let's just say I've lined up a few blueberries on a sheet cake in my day. The goal here is to have fun for the holiday, so every recipe in this occasion is designed for early prep. Picture yourself sitting on the patio with a drink, instead of working away in the kitchen. 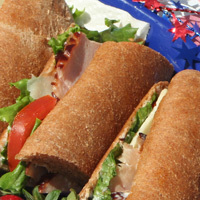 Finish off your spread with some sandwiches: easy for buffets, and you don't have to remember who hates what! 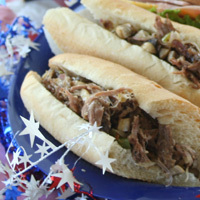 Making your own hoagies adds a little luxury to this simple meal, and who doesn't love a Steak and Cheese? 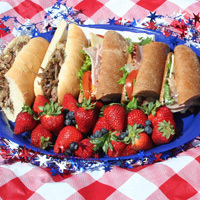 See below for some other fun dessert ideas, and we'll see you at the fireworks. Note: We used white bread for the steak and cheese and wheat bread for the subs. 3 or 4 days ahead: Put your ice cream bowl in the freezer. 2 or 3 days ahead: Prepare the Frozen Yogurt: You will make half berry and half plain to create the pictured colors. It will need to set up in the freezer at least overnight. day. Store in the freezer until ready to use. Both of these recipes can store in the freezer for up to two months. Saute vegetables for steak sandwiches and mix with cheese and shredded roast. 1 rump or chuck roast, abt 6 lbs.